It was a very good year for friendships, both old and new. Friends at grad school, friends at dance rehearsals, blogger friends, neighbor friends; it was an exuberant year of friendship. Between my frequent trips to India and travels all over US, I made friends, good friends, in the most unusual places/situations—on a shuttle bus to the airport, on a 12 hours long flight with a dysfunctional in-flight entertainment system, at an airport cafe as I sat alone staring at my empty beer glass while waiting for the connecting flight, and at the George Bush International Airport as I was being momentarily held due to bureaucratic inefficiencies. Friends from Dubai, Barcelona, Berlin and Lahore. And it appears that, thanks to Viber, Whatsapp, and facebook, our friendships will withstand the threats of time and distance till we meet again. I also managed to stop over at Delhi, Mumbai, Pune, Vishakhapatnam, and Hyderabad (in addition to Kolkata) to meet up with several of my old friends. Yesterday, as I sat at my desk looking through the pictures of the times spent with my friends, outlining a chocolate cake recipe in my head, and devising a blog post to dedicate to them, I realized that, during my recent visits to India, most of the time with my friends was spent in the dhabas around the airports in all these cities. Dhabas are these bucolic road side (highway truck stop) restaurants in India that are always open. 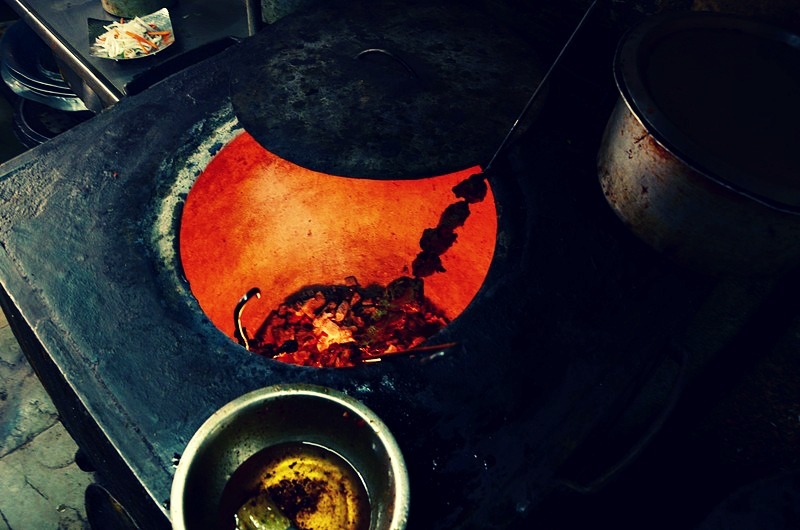 They mostly serve (dhabas in certain regions of the country also serve more simplistic eggs and lentil based dishes) heavily spiced northwest frontier cuisine cooked in tandoor ovens, and are popular for their vibrant and musical atmospheres and economical rates. I love dhabas because of their awesome food, because of their charcoal-burning-clay-ovens with their incessant orange blobs of fire that glow like sun in the dark, because of their charpoys, because of their lassis, because of their indiscriminate use of butter, and because of the endless whistling of their aluminium kettles overflowing with masala chai. Because when I meet a friend after ages, brimming with excitement and long kept secrets and gossips, all I need is a 24 hours open restaurant and a frequently replenished cup of tea. Furthermore, all airports have a nearby dhaba making them easily accessible places for the always-on-a-time-crunch kind of traveler like me. Although, the quick service time at these dhabas, the ceaseless commotion, and the continuous noise of the aircraft engines flying over our heads are a continuous reminder of the transient nature of these meetings. Heat oil in a pan and add bay leaf, cloves and cardamoms. Give it a stir and after about thirty seconds add chopped onions and sauté over medium heat until it turns golden brown, about 12-15 minutes. Add ginger and garlic paste and sauté for 2-3 minutes. In a small bowl mix the powdered spices with 3 tbsp of water and add to the pan. Cook, stirring occasionally, for 4-5 minutes, or until oil separates. Next add tomatoes and green chilies and cook, turning the heat up, till the tomatoes turn soft and oil starts to separate again, about 5-6 minutes. Add chicken and cook covered over medium heat until done. Should take about 5-6 minutes. Add cashew paste and cook for 2-3 more minutes. Now turn the heat down again, and slowly add whisked yogurt while stirring continuously. Cook for another 10-15 minutes over low heat. Add salt before turning off heat. Finish with cream, butter and kasoori methi. Transfer to a serving bowl and garnish with cilantro, boiled eggs and fresh cream. Wish I could give it 10 stars!! It was FABULOUS!! My very picky DH LOVED it, and my 15 year old son, a connoisseur of all things food, LOVED it as well and wants me to make it EVERY WEEK!! I doubled the sauce, but only added 1/4 tsp of red pepper as we don’t like things too spicy. It was PERFECTLY seasoned, with plenty of sauce to spread over the rice. Will most definitely make this regularly. Have already shared it with many friends! Thanks for sharing it! Great! Definate kick from the red pepper! I thickened the sauce with some cornstarch. And added some chopped green onion and cilantro the last minute! YUM! I’ll make this one again for sure. Eating at dhabas were always special. 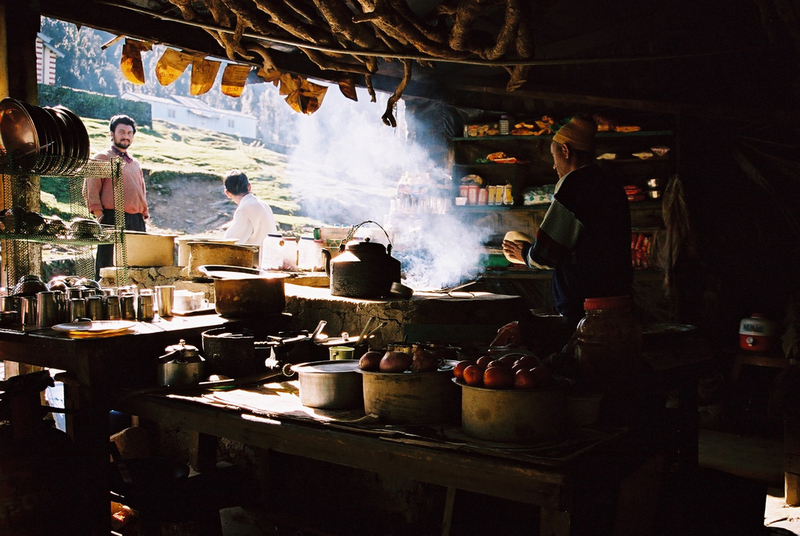 Have fond memories of eating at local dhabas on our way to Darjeeling. The smell of fresh cooked food with its rustic feel makes it more special ! And undoubtedly chicken bharta is one Dhaba special that I always order along with Tadka dal, dal makhani. Sadly, one of my favorite dhabas closed down recently..Our very own The Dhaba @Ballygunje. But to compensate for that, I made it today. And am proud of myself ! Tastes absolutely Dhaba style ! Lip smacking. !